I’m convinced at this point that grouchy old Miyauchi-sensei knew exactly what she was doing when she forced the Karuta Club to name Taichi as President. And right now, she looks like a friggin’ genius for doing it. 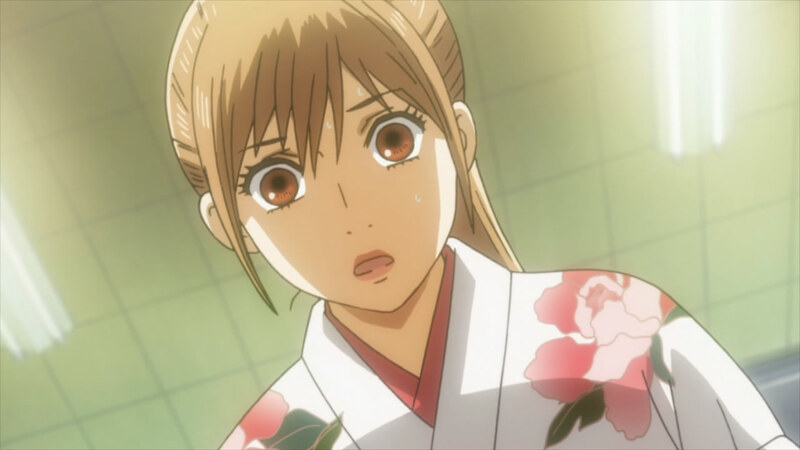 Mind you I often find myself defending those good-hearted but tone-deaf male leads as I have a soft spot for that kind of character, and I adore Chihaya in spite of her failings. 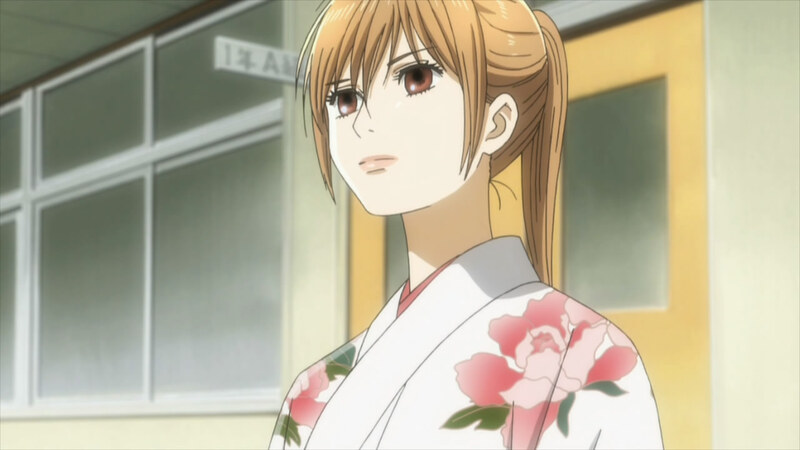 That said, though, she’d be the worst possible person to lead a karuta club (or anything else at this point in her life) because she’s so single-minded and almost literally runs around with blinders on. 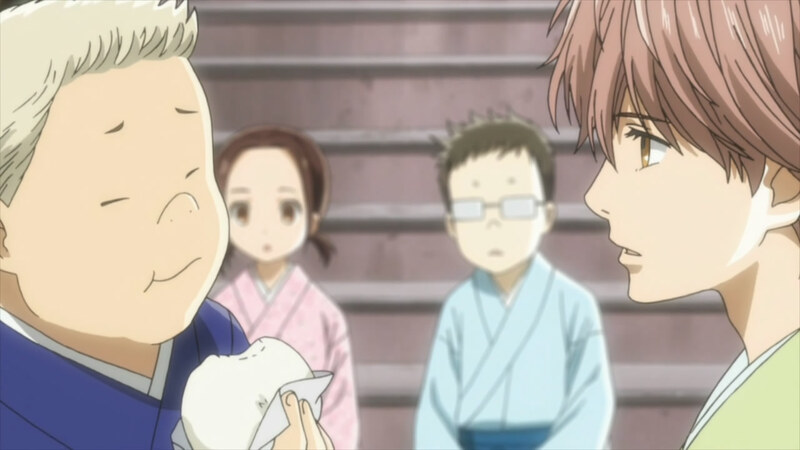 Taichi, on the other hand, is continuing to show himself as a remarkably poised and sensitive kid. 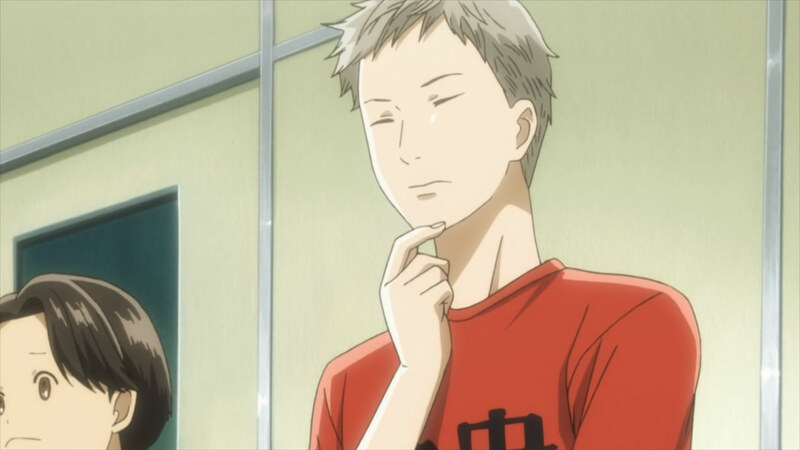 I have a theory (based on personal experience) that people who think too much tend to be more unhappy than people who don’t think very much, and Taichi certainly falls into the first category. He carries a lot on his shoulders because he’s considering the implications of everything that happens, but that quality makes him ideal as a club president. Case in point this week was Tsutomu. 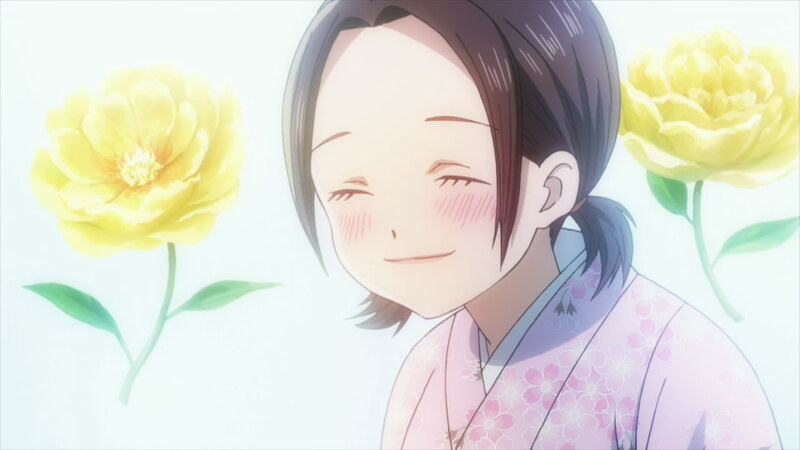 It was great to see a focus on the two weakest (and though everyone on the team is of an age, they seem the youngest, too) team members, and both Kana – who seems to be nearing a record for most flower-framed close-ups) and Tsutomu had some great moments. 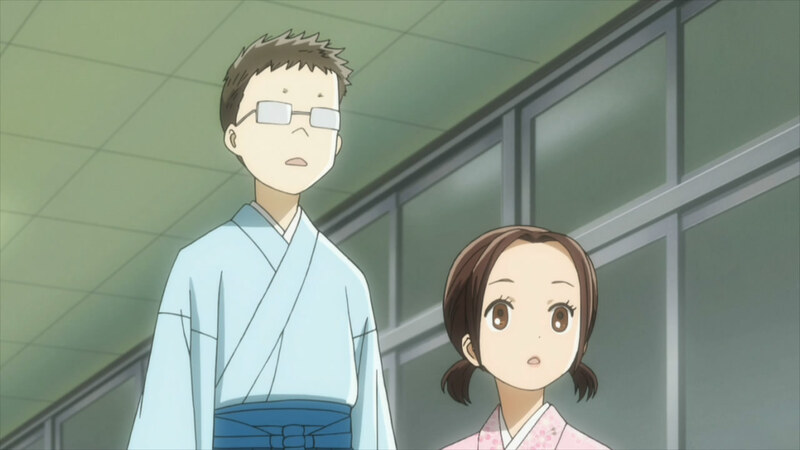 Naturally both of them were a little overwhelmed at the prospect of their first tournament – not that it stopped Kana-chan from seizing the opportunity to turn the club into walking, perfectly-dressed billboards for her family’s traditional clothing business. But Kana took to the competition a little better than Tsutomu did, and even stole her first win. Understandably this made Tsutomu feel even worse, especially given the fact that he’d attacked karuta as he attacks everything, trying to beat it into submission with hard work. 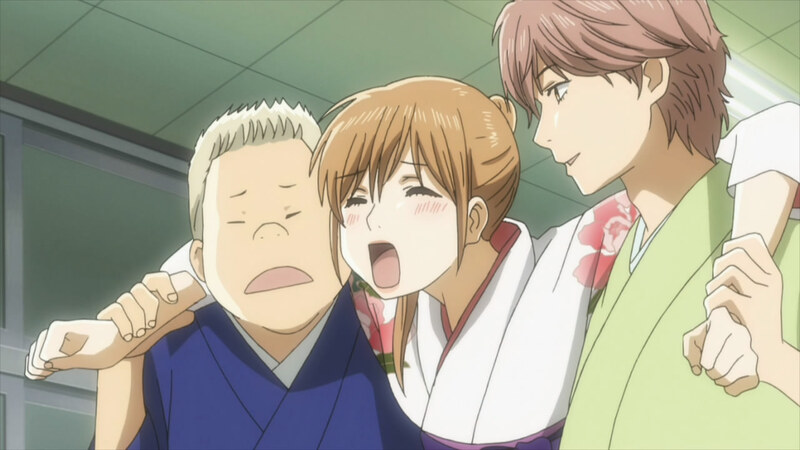 Unfortunately Chihaya was so focused on celebrating Kana and the team’s success through the early rounds that she didn’t see that Tsutomu was slipping deeper and deeper into a funk, while Taichi and Nishida seemed to sense trouble brewing. While not being used to giving orders may have made Taichi hesitate, when Tsutomu cracked and announced he wasn’t needed and was leaving for the day he stepped in and salvaged the situation by ordering Tsutomu to sit out the semi-finals but play in the finals. Whether through instinct or calculation this was exactly the right move, as it gave Tsutomu – who would have been useless in the semi-finals in his state – a chance to reflect on his selfish actions, and the others to focus on pulling together to get through their match against an obnoxious opponent that relied more on shouting than skill. 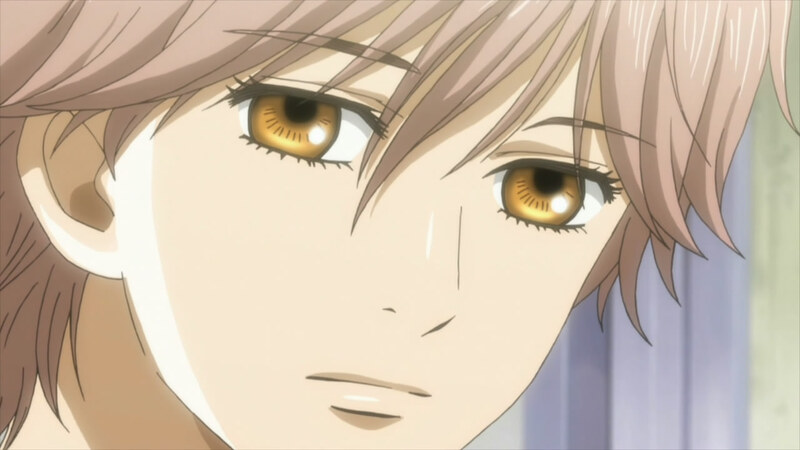 Here again, Taichi stepped in to right the ship when Chihaya was faltering as a result of her guilt over Tsutomu’s breakdown. By deliberating spraying a slew of cards across the room, he gave himself a chance to get up and give the others the pep talk and pat on the head they desperately needed to get their mojo back. Whether he knows it or not, Taichi has the makings of a natural leader. 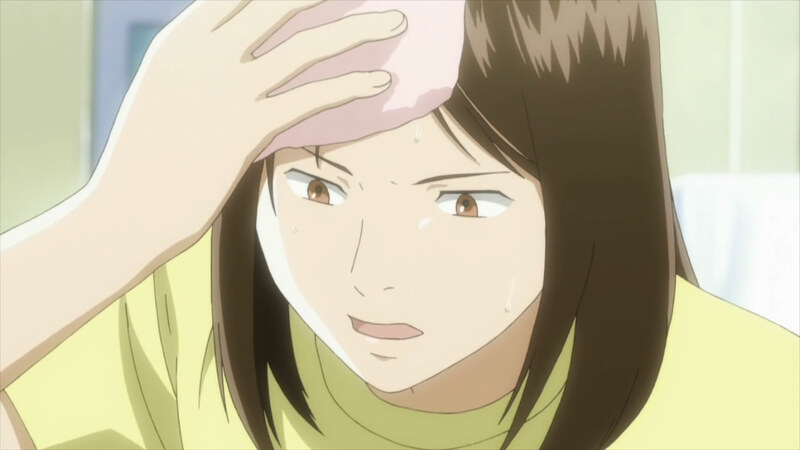 As it stands, Mizusawa is through to the finals based on Chihaya, Taichi and Nishida going undefeated – though Chihaya cut it close in the semi-final and had to fight back from being down eight cards to two. Nishida appears to be just as strong as ever, solid and unshakeable at the center of the team, and Taichi seems to have benefited from all those drubbings by Chihaya. As for the noobs, Kana-chan is clearly the further advanced at this point, having won her first match and come close a second time. The matches were interesting to follow, and the show is showing itself capable of some very exciting tournament episodes. As in Go, much of the strategy comes from the playing order – trying to find the matchups most beneficial to your team via a blind draw, even if that means trying to place your weakest player (Tsutomu) where you think the opponent’s “A” player will be and effectively throwing that match as a trade-off for better matchups in the others. In the finals awaits a very powerful team including old nemesis Kinashi “Retro” Hiro (Nakai Kazuya) and a mysterious sadist (“I like to toy with pretty girls”) that’s made the Nationals five years running. This show was definitely the biggest surprise for me this season. I love shoujo manga/anime, but this show was based what seemed to be a pretty boring game to be based around. I look forward to the character development and the fleshing out of the backstory every week. Thanks for reviewing this show; I love to read someone else opinions after having watched to see if I missed anything. Dwarf-star alloy? Why that’s Doctor Who! I really just wanted the cookie, though… Om nom nom! Here you go – double-chocolate chip, hot from the oven. I had the same thought about them illustrating how Chihaya being president was a bad initial idea. Taichi seems to be really developing his own idea of team support. I have to think if his mom wants to see him succeed she’d be proud of this side of him. I had a thought at the end of the episode that sooner or later if they blaze tournaments and rise in ranks they might wind up in a paper or something. I’m excited to see if they will be discovered later on or if she kind of knows about it before they get recognized. 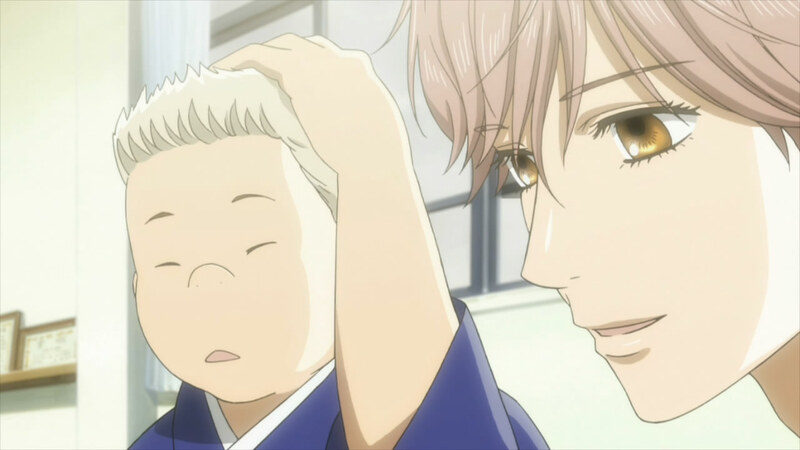 I’m sure if it gets around her son is leading a successful Karuta team people she knows would be mentioning it as a point of pride. Tsutomu has got some major pride issues but he’s fightin hard it’s good to see he ran back rather than just walking off or calling for a ride home. Great drama. I agree. 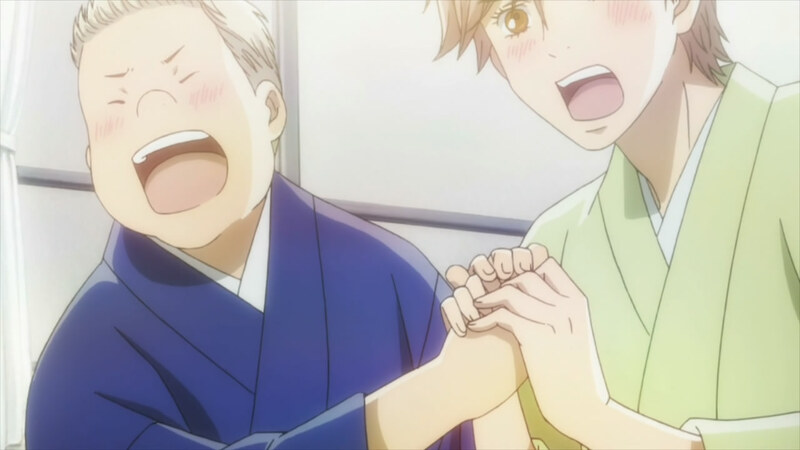 Taichi is how a main supportive character should be done. Just because he’s not as strong as Arata or Chihaya doesn’t mean he can’t play a very important role as the series progresses, nor does it make him dumb. Too often anyone who isn’t the ‘best’ is completely sidelined because they just can’t compete. No wonder it’s hard to categorise this josei series with shoujo leanings, because it shows us how a good shonen sports series should be done! 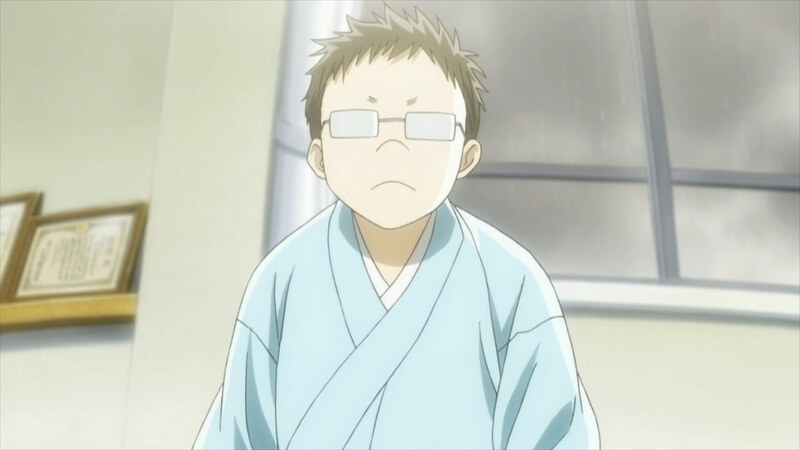 I find Tsutomu (and young Taichi)realistic of forced high achievers: if you’re normally good at something, you hate the humiliation of being showed up when so much of your self-esteem is built around succeeding. I agree with your theory, Guardian Enzo, I think being introverted or at least reflective can lead to problems that going into everything obliviously and self-centeredly avoids. 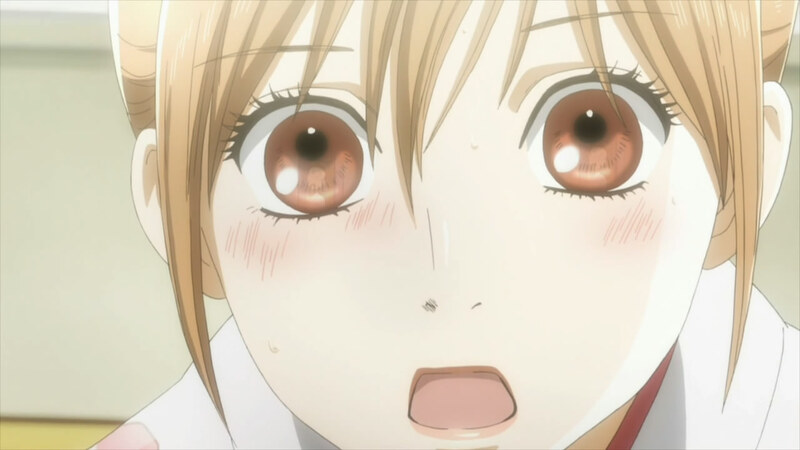 Though I wonder if Chihaya’s oblviousness is a coping mechanism she’s brought upon herself. 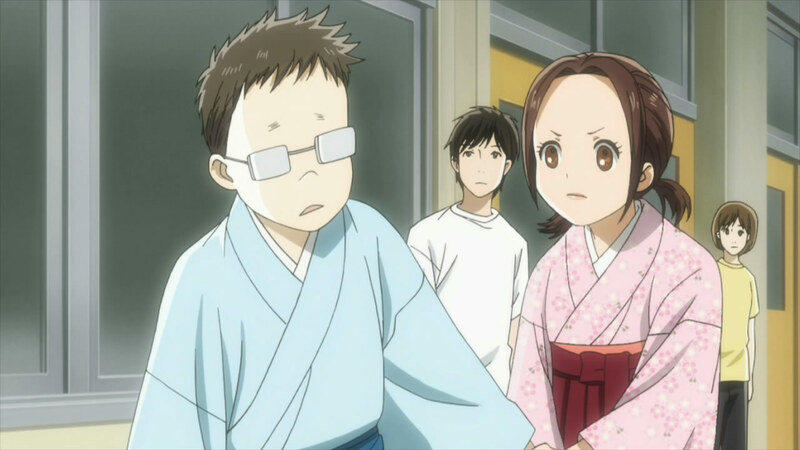 Given the way her family acts, if one was as reflective as Chiaki or Tsutomu the outcome would be a lot worse. 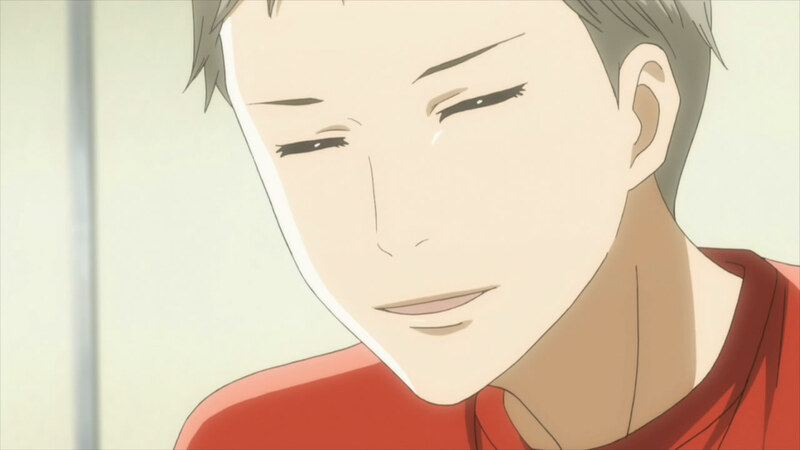 the issue being that he and Arata both believe that Chihaya “belongs” to both of them. sorry for being a noob, but actually I didn’t quite get what Taichi meant by that. anyone care to elaborate? I don’t think you’re supposed to know exactly what he meant there, though I agree it’s a “guy thing”. Here’s how I see it. 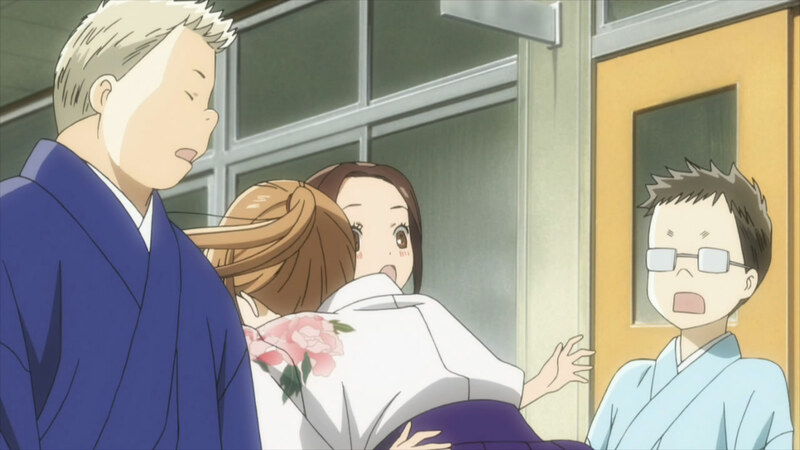 Chihaya is still available – either guy would be in the right in going for it. 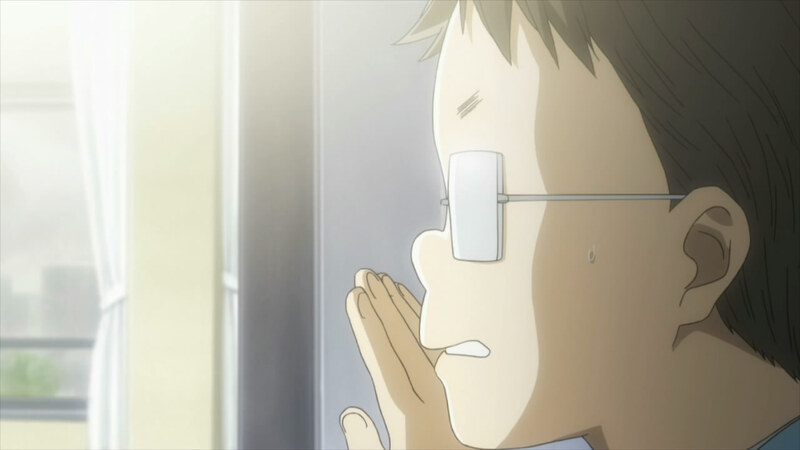 But as long as Arata is not present, it’s not a fair fight. 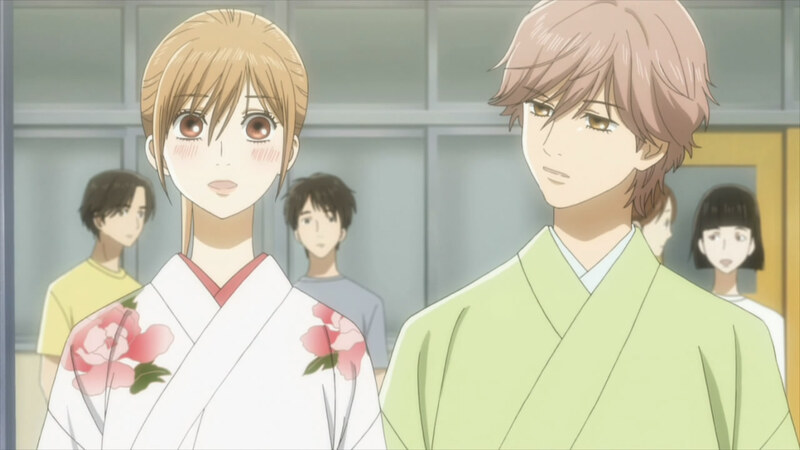 If Arata starts texting directly to Chihaya, that gives Taichi the moral OK to make his own move – which is much easier when Taichi is actually standing right next to her. Therefore, by contacting her directly, Arata would be strategically disadvantaging himself according to the guy code. Oh, that makes more sense now. Thanks for sharing a “guy thing”. 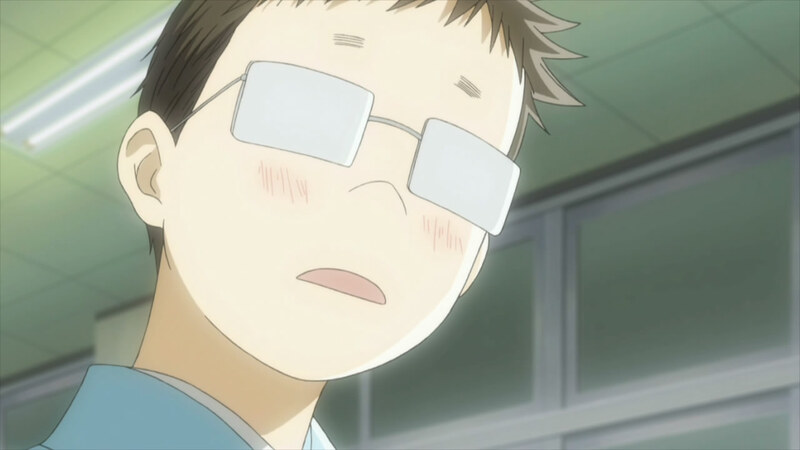 Now I can’t wait until Arata appears physically in the show. I don’t mind being spoiled (of course please use the spoiler tags for the sake of others *wink*) so will his appearance occur anytime sooner? That’s honestly why I like them… I read these reviews because I enjoy and respect the opinions of all the RC writers. I’m not looking for just a recap of the episode, or even a detached analysis of the show’s techniques. I want to see what they though. There’s opinions I love to hate, but generally, I have to admit like Enmire that I like to see what others think of the series I read- it always brings up new great things I haven’t considered or weaknesses I haven’t confronted. …and the others to focus on pulling together to get through their match against an obnoxious opponent that relied more on shouting than skill. 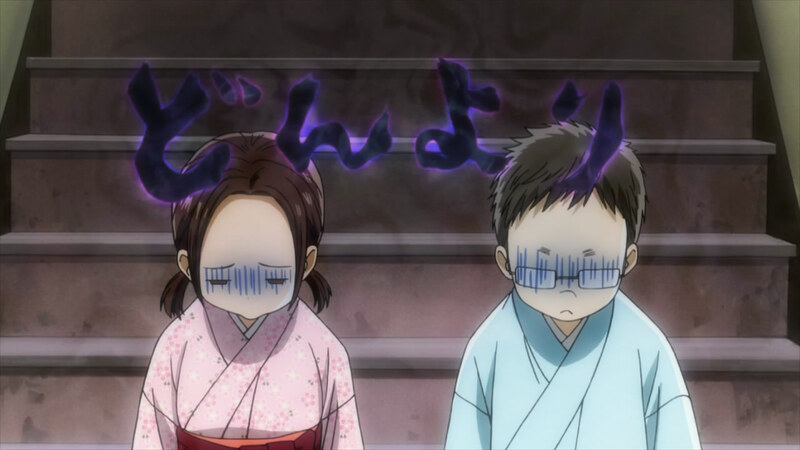 Chihaya did the exactly the same thing during her Class-A tournament. Their opponents this time are trying to bring team morale to their match. How can you really consider that foul play? It is rather cynical to say that it was meant to be obnoxious. As in Go, much of the strategy comes from the playing order – trying to find the matchups most beneficial to your team via a blind draw, even if that means trying to place your weakest player (Tsutomu) where you think the opponent’s “A” player will be and effectively throwing that match as a trade-off for better matchups in the others. It is very strange you didn’t put more focus on whether it was cruel of them to put beginners out to get slaughtered. Despite Kana winning a match, can any of the two beginners win in a critical match? I could understand their desire to win, but still I can’t believe they never gave it a second thought to Tsutomu’s feelings until after he ragequits on them. Cruel? Thoughtless, maybe, but I wouldn’t say cruel. It’s part of the game, that’s all. Besides, it’s a blind draw so there’s no way of knowing for sure who anyone is going to be playing anyway. In terms of “foul play” that’s your wordage, not mine. I said obnoxious and I meant it – they were obnoxious. 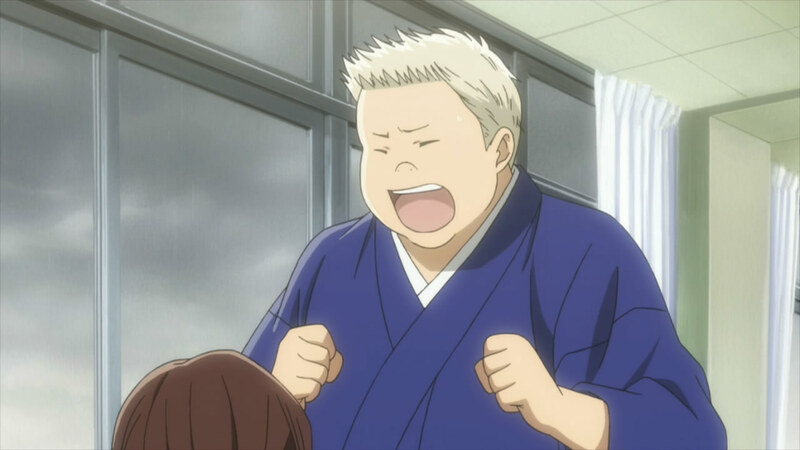 Constantly shouting during a sport like karuta is a very deliberate attempt to rattle your opponent. Why do it? Because it often works. It’s not foul play because it’s not against the rules, but it is annoying as hell and once Taichi settled the team down, the truth was quickly evident – they were a lot more about shouting than skill. If you are so mentally weak you let yourself get rattled, it kind of undermines the mind games aspect they were trying to put in. 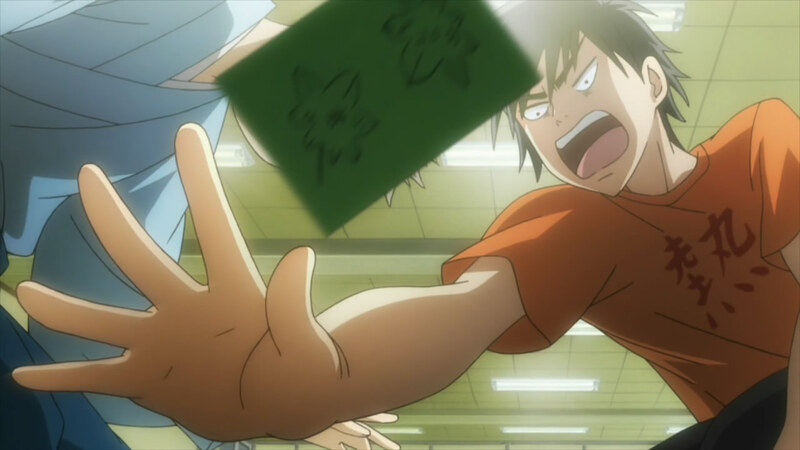 I believe that Chihaya’s faltering was more due to Tsutomu than the other team trying to be obnoxious. I have no idea about the typical courtesies of the game. I did find it a bit odd that Chihaya’s opponents were annoyed by her vocalizations back then. 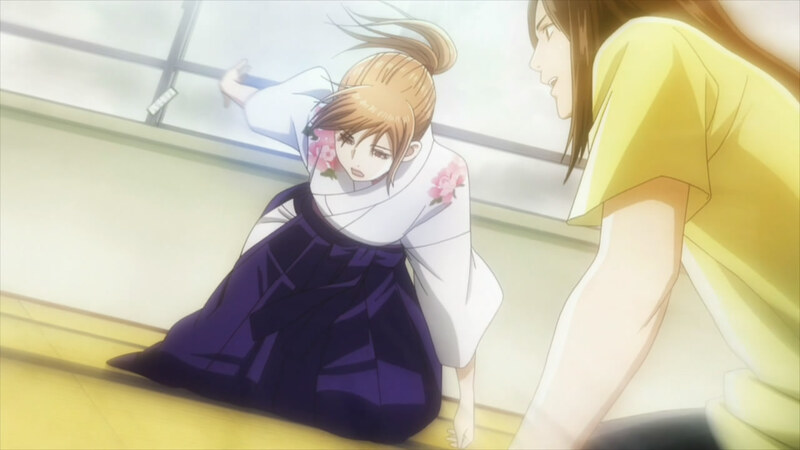 I believe the Karuta sensei said that overpowering your opponent with spirit was part of the game. In some sports, it is not uncommon to meet a team that encourages each other after every good play. You don’t accuse them of being obnoxious as they are simply trying to be positive and it is not indicative of poor sportsmanship. Besides, it’s a blind draw so there’s no way of knowing for sure who anyone is going to be playing anyway. It wasn’t blind draw from my understanding; each team submits an order. The fact that they don’t know for certain made it more awkward an issue of matching the three skilled players for easier wins. I am not saying that they are cruel, I just think that you should have covered your thoughts on this issue rather than the strategy aspect of trying to manipulating pairings. 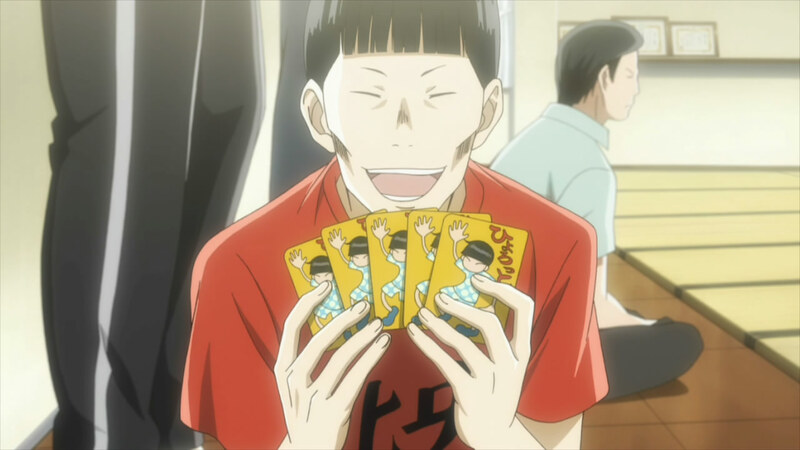 In real match of Karuta, yes, they do shout, and it is completely allowed. It’s just until the reciter finish reading. The background sound effect of around 6’00″ in episode 10 is likely to be recorded at some real highschool tournament. 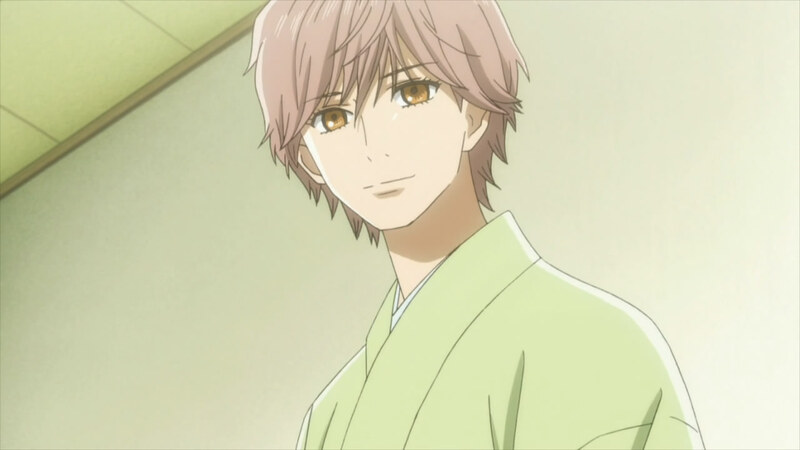 In episode 6, Taichi mentioned about 4-3-1-5. which is the method for reciter. -read the upper verse with 5 seconds. Since every match is decided within 2 seconds of upper verse, you can shout anything in the following 7 seconds. After that, as Arata explained in episode 3, no one including players and audiences allow to make a single noise until the reciter reads next card. This rule must be annoying for Kana-chan, for no one is caring for lower verse lol. lol @you quoting house. i keep putting the new season off. is it any good? concerning this show. i am slightly (really, only a little bit) annoyed when they start screaming around so suddendly whenever the drama part starts. in this case the lunch scene. i think madhouse always takes it a little bit too far in this aspect of the show, but not enough to really bother me so it’s ok.
It’s been quite a good season, though not at the level of the peak three or four years ago. I was responding to the question about “House”, actually! 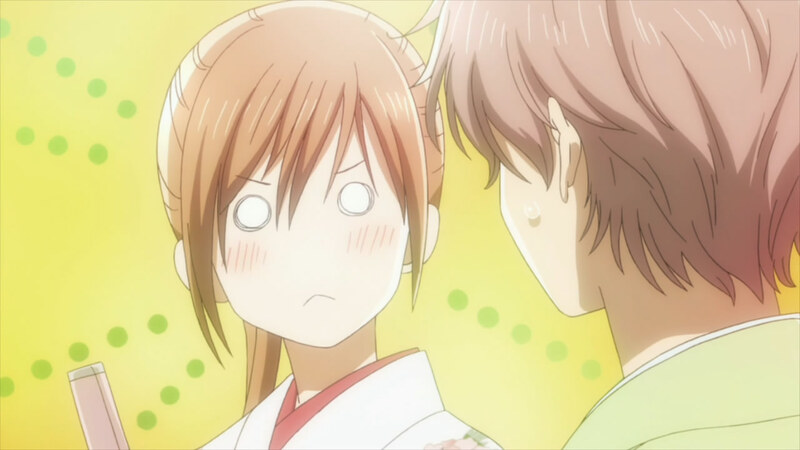 after 10 episodes.. i still dont like chihaya. Oh please don’t compare it to classics like Major and Hikaru no Go. Baseball has far more depth than simply 160 kilo pitches. Team play isn’t reduced to ragequit & emotional breakdowns. I can understand Goro’s passion and love for the game which kids across the globe love to play. 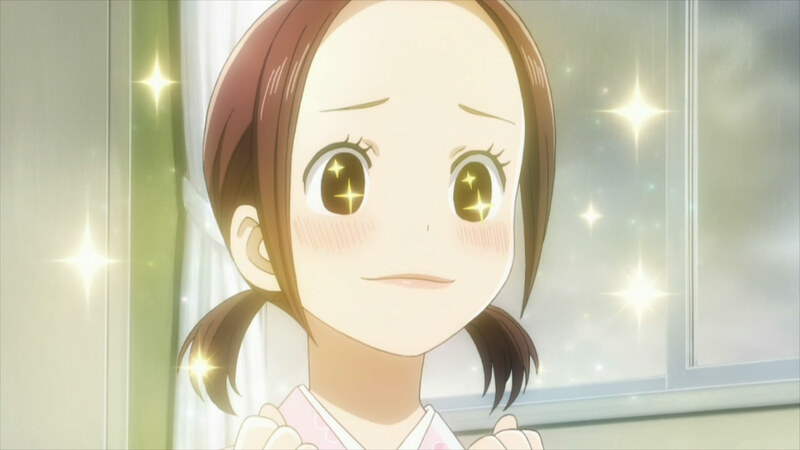 On the other hand Hikaru no Go shows us a series about a boy falling in love with a game. 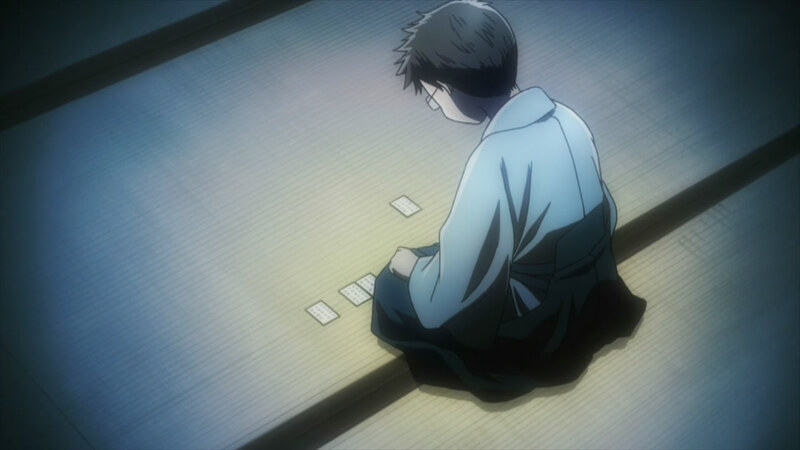 It is similar as you can’t really tell what is going on in the game, but Hikaru no Go is far better and conveying the joy, emotions and passion of the game. I can kind of understand why they find Karuta amazing like how they describe when they take a card, and yet there is not the fundamental understanding. 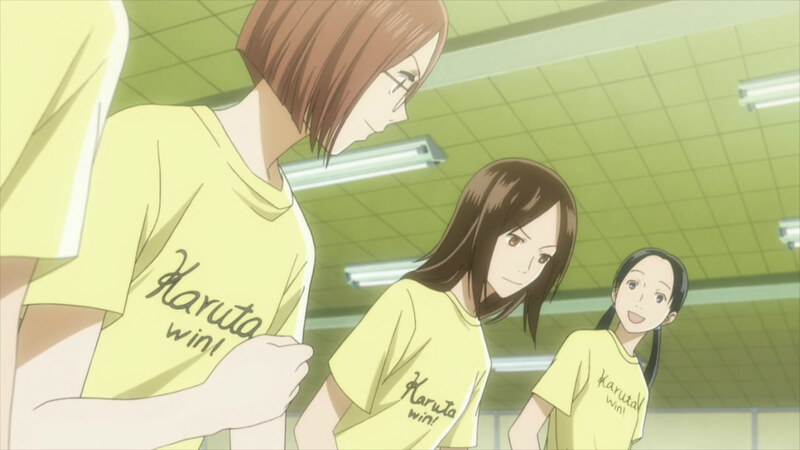 Simply put, I have fun watching Goro and Hikaru play the sport, whereas, Karuta is simply part of the plot. On a separate note, I think that it is quite fast paced and I enjoy how they skipped to this point in time. I would describe this as a feel good episode, a bit predictable but easy and fun to watch. I am more so looking forward to reunion of the trio rather than winning a hard match against retro’s top tier school. 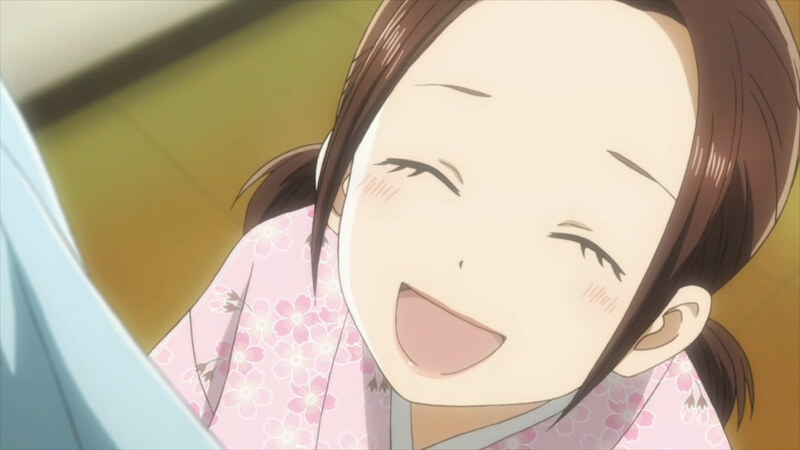 I wrote an article for those who are dubious of Karuta’s depth. My EngRish may be hard to read, but I wish some of you find there’s some kind of depth with Karuta at least. actually Enzo, the way the episode got screen-capped it looks like Kanade got the most animated extras around her (and not just the flowers) (and discounting Chihaya’s many abnormal faces) so far in this show. …anyone cared to correct me on that? This show, and this episode, is the main reason why I am so glad I got back into watching anime. I laughed, I had several heartwarming moment, and felt good so many hours after watching it. This show puts telling a good story first and foremost. 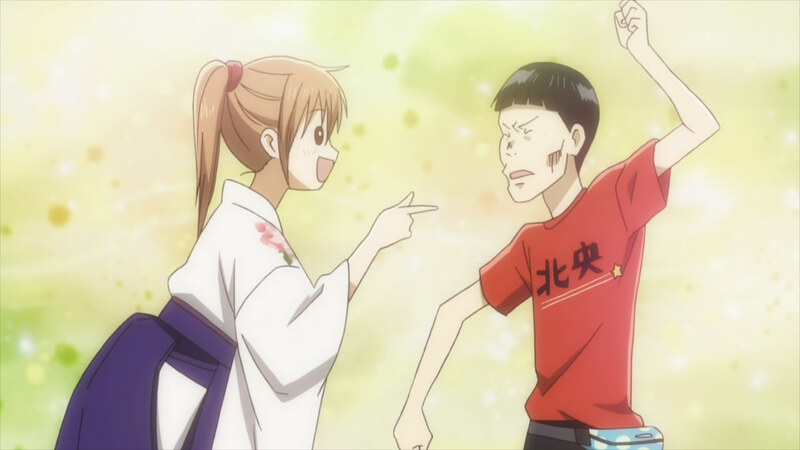 I enjoy this show even though there are definitly moments where I cringe at some of the cheesiness. You make the funniest comments. I laughed out loud at “Even Chihaya, dense as dwarf-star alloy (a cookie for anyone who can spot the reference) when it comes to human feelings, has picked up that something is bothering Taichi.” Good job on the enjoyable review. I can’t wait for your review for episode 11, the best yet so far. ok, scratch the last sentence. I see that you posted episode 11 yesterday. I never expected to love this show as much as I’ve come to. 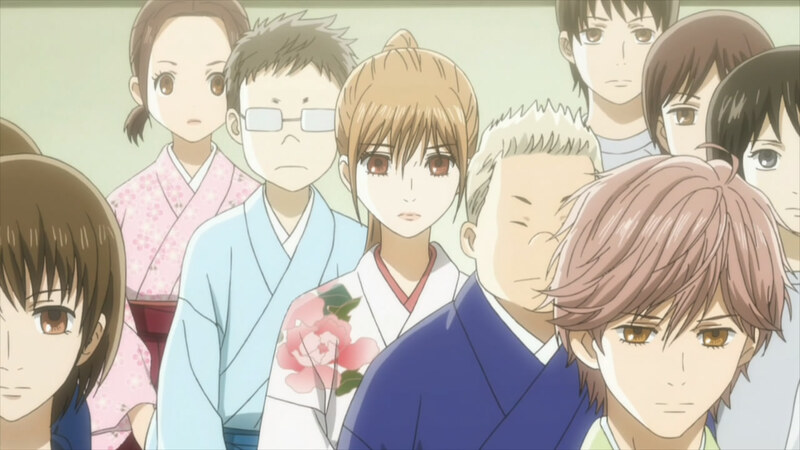 I will absolutely own Chihayafuru. Only 10 episodes in and I’m dead-set on it; hell, at 2 episodes in, I was hooked. I’m loving the genre blending, and the subtle complexities that make up the characters and their interactions. Thanks so much for blogging this!! I couldn’t agree more! definitely a hidden gem of the season!